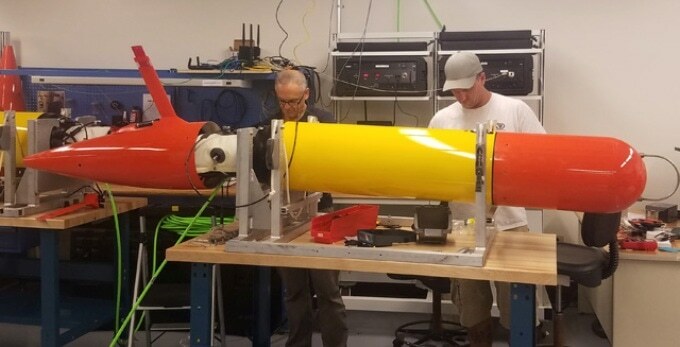 As a first ever attempt, researchers at the University of Hawai‘i at Mānoa (UH Mānoa) and the Monterey Bay Aquarium Research Institute (MBARI) will be deploying a small fleet of long-range autonomous underwater vehicles (LRAUVs) with the potential to automatically gather and catalog seawater samples. The innovative robots will enable scientists to trace and investigate ocean microbes in unparalleled detail. Ocean microbes generate nearly 50% of the oxygen found in the atmosphere and eliminate vast quantities of carbon dioxide. They are also the basis for marine food webs, including the ones that support global ocean fisheries. Edward DeLong and David Karl, oceanography professors from the UH Mānoa School of Ocean and Earth Science and Technology (SOEST), have been investigating these microbes for many decades now. For this study, they and their colleagues have partnered with engineers from MBARI to analyze innovative means for adaptively sampling oceanographic attributes such as open-ocean eddies—swirling masses of water moving gradually across the Pacific Ocean—which could have larger impacts on ocean microbes. In late February 2018, engineers from MBARI concluded the development and investigation of three innovative LRAUVs in partnership with UH Mānoa researchers. Last week, they delivered them for their first ever deployment in Hawaiian waters. While moving through the ocean, the LRAUVs gather information related to chemistry, water temperature, and chlorophyll (an indicator of microscopic algae) and convey these data to researchers on shore or a ship stationed close by. Moreover, a distinctive feature of these AUVs is an integrated Environmental Sample Processor (ESP), a miniature robotic laboratory that gathers and stores seawater samples at sea, enabling scientists to capture a snapshot of the proteins and genetic material of the organisms. For nearly one and a half decades, MBARI has been creating ESPs. The size of the prototype instruments developed earlier were nearly the size of a 55-gallon drum. The most recent ones, or the third-generation ESPs, have a diameter of just eight to ten inches (almost one-tenth their original size) and were designed explicitly to fit inside an LRAUV. When we first talked about putting an ESP in an AUV, I thought to myself ‘this is never going to happen’. But now I really think this is going to transform oceanography by giving us a persistent presence in the ocean—a presence that doesn’t require a boat can operate in any weather condition, and can stay within the same water mass as it drifts around the open ocean. Through its surveying potential, the LRAUV enables researchers to find out, trace, and sample open-ocean eddies, which could be more than 100 km, or 62 miles, across and last over many months. When these eddies spin anticlockwise, they draw water from the depths up toward the surface. Normally, this water carries with it nutrients required by the microscopic algae, that is, phytoplankton, to survive. The new LRAUVs can transit for over 600 miles, and use their own ‘eyes and ears’ to detect important oceanographic events like phytoplankton blooms. These new underwater drones will greatly extend our reach to study remote areas, and also will allow us to sample and study oceanographic events and features we can see by remote satellite imaging, even when ships are not available. An expeditionary cruise aboard the Schmidt Ocean Institute’s (SOI) research vessel Falkor will leave for open-ocean experimentation of MBARI’s newly developed LRAUVs on March 10, 2018. As part of this cruise, the scientists will discover an eddy by using satellite data and will then deploy the LRAUVs to investigate the feature and gather water samples. Upon recovering the robots when they return to the surface, UH Mānoa scientists will extract DNA from the filters. This information will offer a distinctive understanding of the duration of the eddy, its stability, and its impact on the oceanic systems. It will also help in improving prevalent oceanic models, which are crucial for making anticipations on the well-being of future oceans. “Although this fleet of AUVs will never replace our need for a capable research vessel, it will provide much-needed access to the sea and the collection of novel data sets that would not otherwise be possible,” stated Karl. The Simons Foundation, the National Science Foundation, the Schmidt Ocean Institute, the David and Lucile Packard Foundation, and the State of Hawai‘i supported the study.